From Goodreads: Tod Hudson was a typical teenager. He liked girls, sports, food and tolerated his younger brother, Nash. In fact, he had his whole life in front of him--and due to his bean sidhe heritage, it was going to be a very long life indeed. And then the car accident occurred. 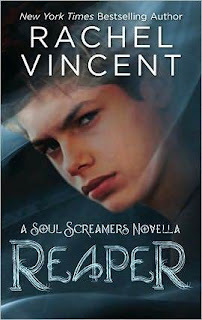 If you are a fan of the Soul Screamers series you really need to read this! I really enjoyed it and I loved having the story told from Tod's point of view. If I hadn't been in love with him before reading this I definitely would have been afterwards. The story is a prequel in the sense it takes place before Tod becomes a reaper. We get to see what he was like, plus we get to see Nash as a 15 year old and we learn of Sabine. I've heard it's best to read this after at least the third book in the series and I would have to agree. I read it between books 3 and 4 and it seemed to fit perfectly. There's quite a surprising revelation in this story that I really didn't see coming but in retrospect makes so much sense. I won't go into details here - it makes you see Tod in a different light but I do wonder if it's been kept a secret all this time. I love this series - I love this world. And damn I love Tod! How did he sneak up on me? Because I was a major Nash fan at the beginning of this series but somehow Tod has completely won my affections! A great addition to the series - I look forward to more of these novellas. I really love the sound of this one. The series is one I'm really enjoying so far, but I still need to read the third (and fourth!) books in the series!